Do you have special traditions for Christmas at your house? I think traditions are how memories are made over a lifetime. As a mom of two preschoolers we are just now forming our own family traditions. I have loved watching the magic of Christmas grow over the past three years with my son, and I can only imagine that this year will be more fun than ever as he really is starting to comprehend what Christmas is really all about. It is very important to us that our children know the true meaning of Christmas and why we celebrate, we love having some fun and carefree traditions as well. 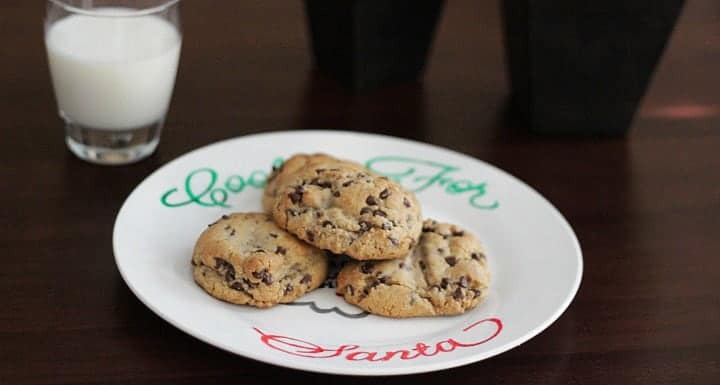 One of the traditions we will be starting this year is a plate of cookies for Santa. Both of my kids love to help in the kitchen so I have no doubt that this will bring memories that will last through the years. 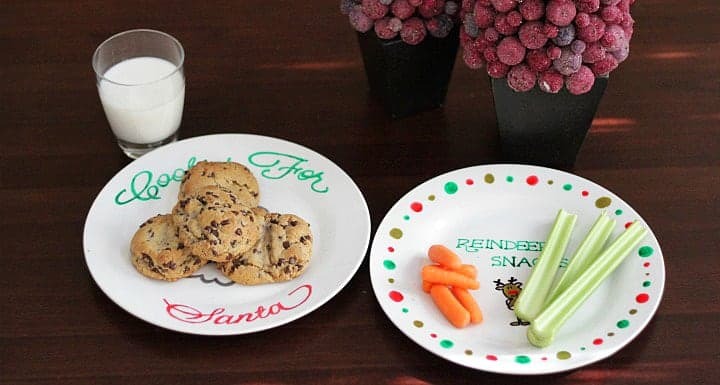 And to make it extra fun we are even making Santa his own special plate to eat from at our house. That will ensure that Dad knows who the cookies are for in case he gets the munchies before bedtime. Making this plate is a really simple and inexpensive craft. All you need is a few tools and the ability to trace! Open your word processing program and type out your wording and add art as desired. (Or download our templates below!) 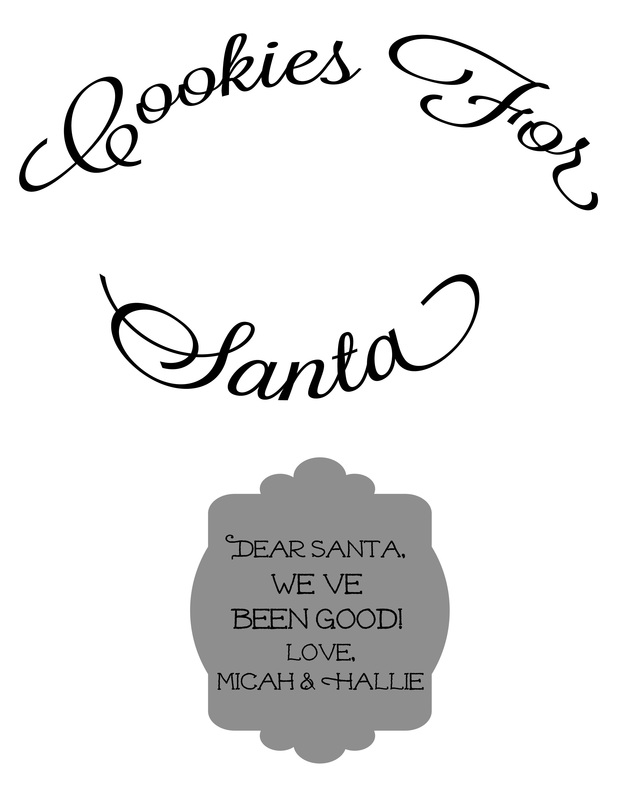 Print out the design and use carbon paper to trace the wording onto the plate. You will need to press firmly, then use your pens to trace over your outline in the desired colors. If you make a mistake you can wipe it off with a wet paper towel while it is still wet – so don’t be too scared to go for it! Once the tracing is done, follow the instructions on your pen to cure. Mine instructs to air dry for 8 hours and then bake for 40 minutes. If you follow the directions, they are dishwasher safe and ready to go! 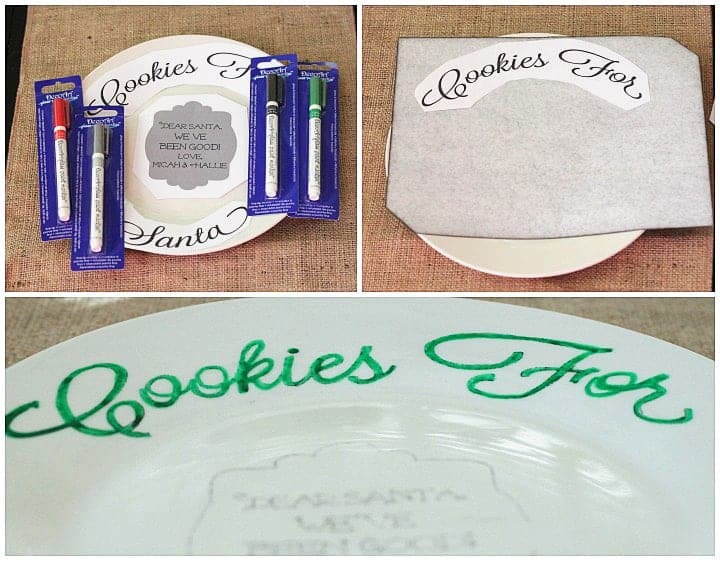 (Please note: the package instructions do say that you shouldn’t eat off things that are painted on, so this is meant to be more of a fun and decorative piece, and not intended for dining.) 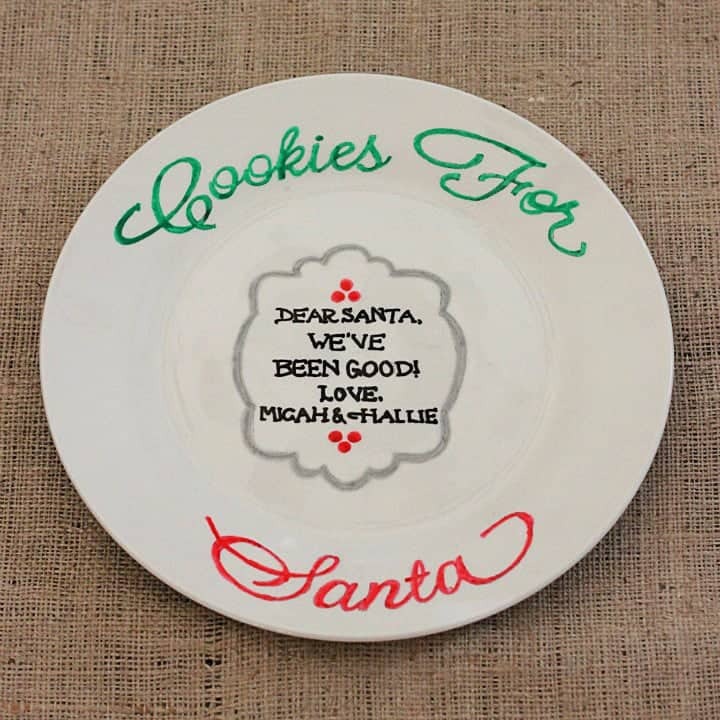 I think Santa will appreciate having his own special plate, and hopefully the note underneath the cookies too!! Oh, and don’t forget the reindeer that have to pull that huge sleigh of presents!! You can get detailed instructions on how to make the one below and the design print out at The Pinning Mama.